First method is for advanced users and the other method is for beginners. If you are an advanced WordPress user then you can easily edit your theme files. This method is for advanced users and not recommended for beginners. 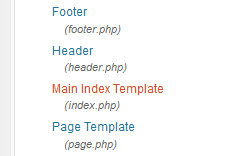 Go to Appearance -> Editor in your WordPress dashboard and then select Main Index Template. Now save the file and see the result. This method uses a plugin. So beginners can use this method easily. Here is a WordPress plugin “Simply Exclude” which can be used to exclude posts based on certain tags and even categories from your blog’s homepage. Once installed you can go to the Settings of Simply Exclude plugin and select Exclude tags in your WordPress dashboard. There you can select multiple tags to stop their posts from appearing on homepage, archive, search or even feed. I don’t recommend the use of plugins for simple modifications. If you are comfortable with editing theme files, you must chose the first method. However its always better to take backup of your complete theme before making any modifications. A really useful stuff, Simrandeep, thank you. Quickly and right to the point. Wow, never thought of that before. This would be a great way to keep your main content or most on-topic content in front of new readers eyes, while the stuff that might not apply to as wide of an audience can rest in it’s niche. Great post. Thanks.